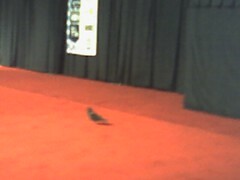 At yesterday's screening of "Cavite", we were surprised to see a pigeon walking around the floor in front of the screen in the Convention Center theater. It then flew up and over the audience, flew in front of the screen at the end of the SXSW intro clip, and just stayed quietly out-of-the-way for the rest of the film. At last year's screening of Hellboy, a bat few into the Paramount. Freaky.